If you like the idea of a campy musical about zombies and horny teenagers and chainsaw violence, you’ve probably already bought about six tickets. And you should! This show will deliver on all your expectations, and you’ll have an amazing time. And if you don’t, you’re already sprinting in the opposite direction. And you should! This show’s every inch as campy and (comically) violent as you’ve been told. If that’s not your cup of tea, stay far, far away from the Randolph. I think it’s highly unlikely that there’s anyone between these extremes: this is a love-it-or-not sort of show. But if you are on the fence, let me nudge you off. Evil Dead (based on the classic horror film of the same title) is about five college students who decide to spend spring break in a secluded cabin in the woods. Upon their arrival, they accidentally activate the powers of the Necronomicon (a tome bound in human flesh) and summon forth a whole slew of demons. One by one, the forces of darkness pick off our intrepid co-eds until just one person — Ash, who now has a chainsaw for a hand — survives. And in the mean time: dancing, blood, singing, blood, violence, blood, awful puns, blood, blood, blood, blood and blood. One unfortunate man at opening night was coated in so much artificial plasma that he looked like a tomato with hair. It’s campy and over-the-top. It’s a ridiculous, loving parody of a cult film. And Evil Dead has some fantastic performances to keep the energy high: Ryan Ward is absolutely invaluable in a role he’s been playing for nearly a decade; Rodrigo Fernandez-Stoll executes some of the show’s best physical comedy with deftness and zeal; but my standout was Alison Smyth, whose role is surprisingly demanding, yet she executes it perfectly, creating an extremely well-defined and interesting character with very little stage time. She also somehow ends up with many of the show’s most difficult movement and dance sequences, all of which she knocks out of the park. And speaking of dance, the entire company moves beautifully, with no small credit due to choreographer Stacey Renee Maroske: her work in the later scenes is especially impressive, and the consistency and fluidity shown by the cast speaks to her talent. Fight director Kevin Robinson also turns in some impressive work, although the Randolph’s wide thrust stage is unforgiving for fight choreography. It’s also unforgiving in other ways. Opening night had mixing problems throughout the show; sitting in the third row, most of the lyrics in the first half were unintelligible. And with a show written this sharply, that’s a pity. Much of the physical comedy also seems to be playing directly to front row center — which makes for some hilarious moments if you happen to be seated in that location, but scoot down a few seats and suddenly you’re missing the joke. The good news is that the blood definitely makes an appearance — and the overhead jets will ensure that you get your fair share, even if the actors happen to miss you. What I’m less certain about is the sheer volume of merchandise and other stuff for sale: whole carts of the stuff is schlepped through the auditorium before and after the show and during intermission. Baseball caps, foam chainsaws, bowling shirts and cast albums are yours for the buying. Bring cash, if that’s your thing. And that may be my greatest point of reluctance here. Evil Dead is a fine show with much to commend — and has already sold so well that the run’s been extended. But while it’s a good show in a vacuum, that bargain-basement $19.99 ticket, when purchased in advance through Ticketmaster, will run you closer to $35 after taxes and fees. Still worth it? How about $60? Would you pay $90 for a campy, blood-splattered, raunchy evening? A critical mass of people evidently would — and that’s fine! By all means, love this show! Let it change your life! I’m glad it makes you happy! If guts and gore are your thing, lay your money down and get ready to dance in the crimson rain. But if you’re still on the fence, well. It’s your money. 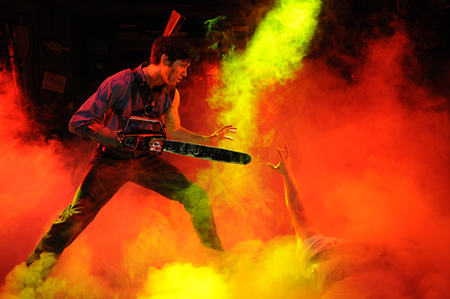 Evil Dead: The Musical plays the Randolph Theatre (736 Bathurst) through the end of December. Performances run Tuesdays through Thursdays at 8 PM, Fridays and Saturdays at 7 PM and 10:30 PM, and Sundays at 3 PM. Tickets $19.99 – $79.99 (plus service charges) See website for details. Tickets can be purchased online, by telephone (1-855-985-5000), or in-person at the Randolph Theatre box office immediately before performances. Be advised that this show involves use of strobe lights, fog effects, lasers, artificial blood, graphic (comic) violence, frank treatment of sexuality, and awful, awful puns. Photograph of Ryan Ward (“Ash”) provided by Starvox Entertainment. This photograph is from an earlier production of this show.